Packed with all the features of our SG series chlorinators, the SWC range utilises a new electrolytic cell design and comes in a variety of new output sizes _ 15g/hr, 25g/hr, 35g/hr, 45g/hr and 60g/hr. 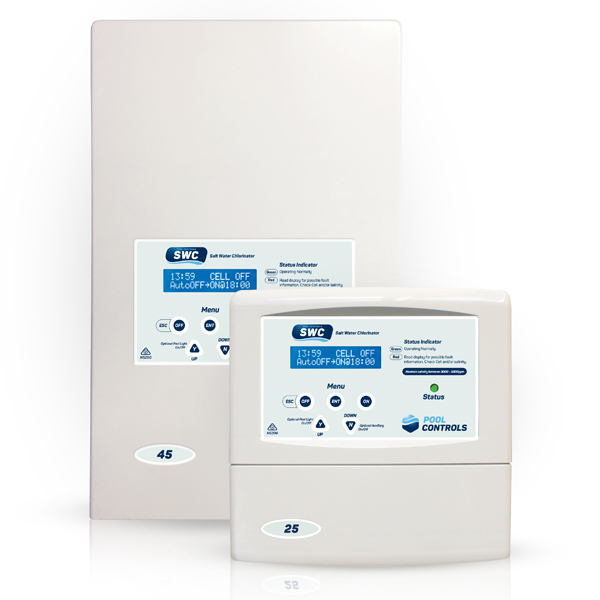 All sizes are available with optional pH upgrade systems.The new SWC range builds on the Pool Controls SG range of salt water chlorinators and come in a range of additional sizes to suit all applications. The new SWC range builds on the Pool Controls SG range of salt water chlorinators and come in a range of additional sizes to suit all applications. Larger pools and those with warmer water and greater bather load are likely to have increased chlorine demand – and this is where a larger sized salt water chlorinator can help. The new SWC 15, SWC 25 and SWC 35 are fully-automated systems that produce 15g/hr, 25g/hr and 35g/hr of chlorine respectively. Proudly Australian-designed and manufactured, the SWC range is packed with features, such as additional timed power outlets for pool lighting or accessories. The new SWC 45 and SWC 60 are the heavyweights of the range and are manufactured in a metal enclosure that will withstand the toughest conditions. The SWC 45 produces 45g/hr of chlorine and the SWC 60 produces 60g/hr – and are able to meet increased chlorine demand with ease.